Ok, so you probably know Garmin timepieces are more than just regular time-and-date watches – for quite a while now, these unique devices are packing ultimate functionality to suit an active lifestyle and tough professional demands. Announced as ‘coming soon’, their latest wristpiece called Forerunner 920XT aims to combine some mean triathlon tracking features and handy smartphone capabilities to live up to the company’s reputation – so let’s take a quick look at it, shall we? Sporting a recognizable Garmin design evocative of other brand’s wrist wearables characterized by a large display, well-built body and comfy strap, Forerunner 920XT is advertised as “15 percent lighter and 18 percent thinner than its predecessor” (Forerunner 910XT triathlon watch), with flexible, hinged watch bands for a snug fit on your hand. Especially designed for triathlon athletes, the 920XT is waterproof down to 50 meters (5 ATM) so it allows you to track your running performances, bike rides and pool laps with equal ease. 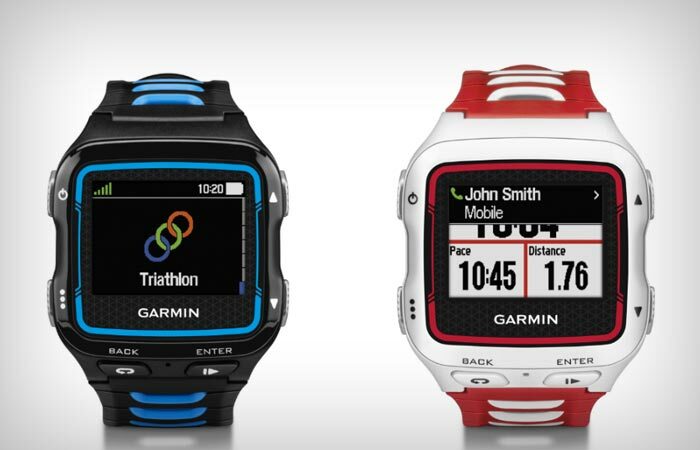 The high-resolution color display provides impressively reliable feedback on your multisport statistics, and it also features a watch mode, 24-hour GPS tracking times (which can be additionally upgraded up to 40 hours on UltraTrac Mode), navigation by GLONASS signals and daily activity tracking options with details on steps, calories burnt, distance, countdown to a custom-set daily goal, sound ‘move alert’ after one-hour inactivity intervals, as well as sleep tracking. Like a host of smartwatches, Forerunner 920XT connects to your Apple or Android smartphone via Bluetooth to access calendar reminders, notifications, incoming calls, emails and texts – which is quite convenient when out in the wild for a forest ride, sea swim or jogging session. When it comes to workouts, Garmin Forerunner 920XT is a neat upgrade of the 910XT: when biking, its integrated altimeter measures ascent, descent and gradient metrics such as riding speed, distance and duration, and it is also compatible with a number of sensors (such as cadence, heart rate and speed) for the most detailed ride stats. When paired with some ANT+ power meters (dual-sensing Vector system and Vector S), it can even display your right/left balance and average watts, and when combined with a heart rate monitor it will show you your estimated VO2 Max during biking sessions. For runners, 920XT displays the standard pace, speed, distances and time and some of the stats measured by the brand’s signature Advanced Running Dynamics found in other Garmin running watches. In combination with Garmin’s HRM-Run heart rate monitor, it can also measure vertical oscillation (amount of bounce during the run), ground contact time (time your foot spends in contact with the ground per step) and cadence (steps per minute). In this configuration, it also displays a recovery advisor and a race time predictor, and there’s also a metronome with vibration capabilities and audible alerts to make sure you keep up the best cadence at all times. And in case you’re a running superman, the UltraTrac mode will extend the battery life up to 40 hours by turning GPS off at regular intervals to keep track of your race however long it may last and wherever wild it may take you. Swimmers will also love the Forerunner 920XT – designed for open water and pool swimming alike, this smart wearable monitors swim pace, distance, stroke count, stroke type and SWOLF score, and there are also a handful of extras like rest timers and distance alerts to keep you right on track and in the optimum pace when in water. Once you’re done with your training for the day, you can also upload your performance metrics to Garmin Connect, a free online community which lets you save, plan, add notes and share your score online. The Connect community can be easily accessed either through the accompanying smartphone application using Bluetooth connection, via USB plug connected to your desktop PC or by automatically syncing your 920XT wirelessly at one or more custom-set Wi-Fi hot spots. 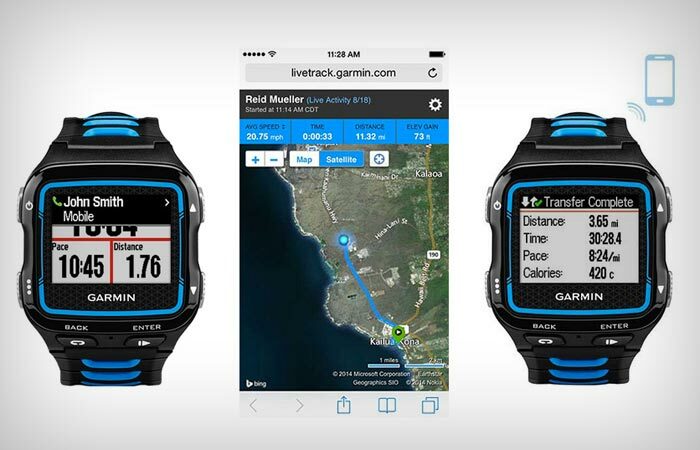 The Garmin Connect Mobile application also lets you invite your followers via email or social networks to follow your LiveTrack session and monitor your statistics and map location. Available in red/white or black/blue color combinations, Forerunner 920XT comes with a $499.99 price tag as a standalone device but you can add some extra dough and get it together with a heart rate monitor for $499.99, so check it out if you’re looking to enhance your athletic performance – because with Garmin, you just can’t step off on the wrong foot.